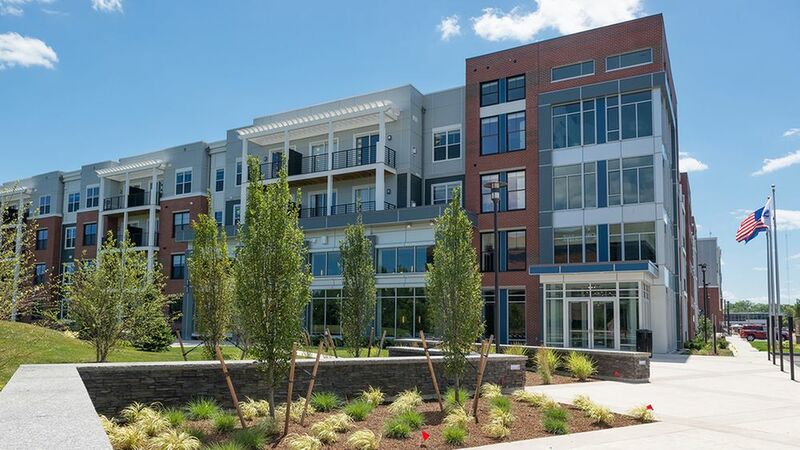 Developer Mill Creek Residential and Medford Mayor Stephanie Burke on September 26 officially opened the 297-unit Modera Medford at 5 Cabot Road near the Malden River and the Wellington stop of the Orange Line. The transit-oriented development’s available apartments start at just over $2,300 a month for one-bedrooms, $2,700 for two-bedrooms, and $3,600-plus for three-bedrooms. The apartments range in size from 602 square feet to 1,479. Modera Medford bills itself as especially friendly to prospective tenants wishing to commute into downtown Boston—the area is but four miles to the southeast. There is that Orange Line proximity, plus a six-story parking garage with secure access and bike storage (and loaner bikes, for good measure). The development, too, includes a newly built 1,000-foot public trail connecting to the Tufts Boat House and the Woods Memorial Bridge. There are also touches such as a roof deck, a pet spa, and yoga space.